PTFE encapsulated temperature probes combine the outstanding properties of PTFE with the accuracy and reliability of platinum resistance and thermocouple thermometry. We offer a standard range of probes or can custom manufacture to suit your exact needs - simply send details of your dimensions, type and quantity required for a quotation. 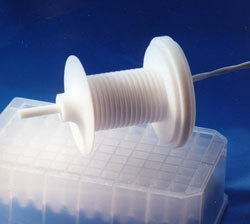 Body: All components are fully encapsulated in pure PTFE. The stainless steel core gives rigidity but can be bent. Cable: 4-wire, 2 red, 2white. PTFE insulated with PFA oversheath. Fused to body. Termination: 1m lead. Extra cable as required. Sensor: PT1000, 1/3-1/10DIN, duplex, etc. For longer cable, put cable length in metres after reference number, e.g. 500.100.1.5 for 5 metres. Cable: PTFE insulated with PFA oversheath. Cable fused to body. Sensor: Type 'J' & 'T', multi-sensors, arrays, etc. 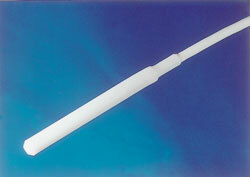 Cable: 4 core PTFE insulated with PFA oversheath. Fused to body. For longer cable, put cable length in metres after reference number, e.g. 500.050.1.5 for 5 metres. We manufacture custom and OEM PTFE Temperature Probes of every description. These can be manufactured in an endless variety of geometric shapes and sizes. For your special requirements please ask.